Sept. 23 Revelation 12 Prophecy/Planets are Aligning Now! Dr Simon Day said a huge landslide at an increasingly unstable volcano in the Canary Islands could send the huge wave speeding hundreds of miles across the Atlantic to the UK. This collapse would create a huge tsunami, which would spread across all sides of the Atlantic, including towards the UK and Ireland. Dr Day said: “It could be several metres high, it depends where you are and how much energy the wave has. The natural disaster expert at the University College London told Express.co.uk the disastrous event is becoming increasingly likely - and urged Theresa May to prepare before it is too late. He said the Cumbre Vieja volcano in the Canaries archipelago was becoming increasingly fragile, and an eruption could send a chunk of land the size of the Isle of Man crashing into the sea. The Lisbon Earthquake of 1755 caused the deaths of up to 100,000 people in the Portuguese city - and also sent a tsunami of around three metres high to the UK and Ireland. It marks the fourth serious earthquake across the globe in the last 24 hours. Mexico was devastated by a 7.1 magnitude on Tuesday, killing at least 223 people and leaving hundreds more trapped underneath collapsed buildings. Two powerful earthquakes struck New Zealand on Wednesday, while Japan had scares of a national disaster after a quake hit off the coast east of Fukushima early on Thursday morning. The earthquake's epicenter is located in the Pacific Ocean, about 175 miles away from the coastal city of Kamaishi about 6 miles below the surface of the earth. This is only one day after more than 200 people died in an earthquake near Mexico City and within two weeks of the 8.1 in Mexico. Hurricane Maria battering Puerto Rico, demolished Dominica. Islands told to 'evacuate or die'. The "potentially catastrophic" Hurricane Maria, the strongest storm on record to make landfall in Dominica, is battering the Caribbean island, and is on course to score a direct hit on the US territory of Puerto Rico -- the first in 85 years. A statement from the National Hurricane Center (NHC) said that its record-topping winds reached 160 miles per hour when it hit the island nation. In an update the Center said that reports "indicate significant damage to structures has occurred in Dominica." Maria, now a Category 5 storm, made landfall on Dominica late Monday, coming ashore at 9:15 p.m. ET. In an update the Center said that reports "indicate significant damage to structures has occurred in Dominica." Maria, now a Category 5 storm, made landfall on Dominica late Monday, coming ashore at 9:15 p.m. ET. It was so powerful that it tore the roof off the residence of the country's leader. "My roof is gone," Dominica Prime Minister Roosevelt Skerrit said in a Facebook post. "I am at the complete mercy of the hurricane said in a Facebook post. Puerto Rico is in Maria's sights. 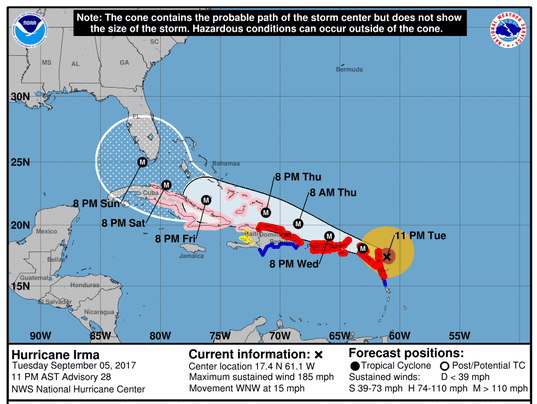 It is moving toward the island as an "extremely dangerous major hurricane, and a hurricane warning has been issued for that island," the hurricane center said. Puerto Rico's governor, Ricardo Rosselló, has declared a state of emergency ahead of that landfall, which will likely happen Wednesday. Earthquakes monster hurricanes horrific fires...what is next?? Will there be record breaking blizzards or heat waves this winter.....????? An earthquake rocked Mexico Tuesday afternoon, just 12 days after the country suffered the strongest earthquake in a century, the Associated Press reports. Tuesday’s quake registered as a magnitude 7.1 and struck about 70 miles southeast of Mexico’s capital, according to an independent earthquake monitoring organization. Mexico is still recovering after it was hit by a 8.1 magnitude earthquake earlier in the month. The disaster was felt by tens of millions and leveled thousands of buildings, The New York Times reported. “It was brutal, brutal. It was like a monster, like a train was passing over our roofs,” one resident told Reuters at the time. 8.2 Magnitude Earthquake HITS Mexico City (VIDEO) Tsunami Warning! THREE HURRICANES NOW! Katia, Irma, Jose ALL THREATENING! We have a hand pump water well, a Berkey water filter, plenty of food in our survival closet, a couple of generators, gas stove that will work with matches when the electricity goes out, hand crank radio/flashlight, plenty of flashlights, candles, and steel shutters, steel roof. It happens shortly after the 2 minute mark! Astonishes Dutchsinse! Hurricane Irma Update Sept 2 New tropical wave off Africa.